Composting is easy, fun, saves you money and helps you to grow lovely plants. Whether you live in a flat with a balcony or have a family and garden that generate large amounts of food and green waste, this book shows you how to compost everything that can be composted - at home, work or school, and in spaces big or small. It covers: * creating the right mix for successful garden compost * how to compost your food waste safely * the full range of composting systems, from plastic 'daleks' to large-scale units, including prices and suppliers * composting with a wormery * making liquid feeds and your own seed and potting compost * composting in schools, with advice on getting a school scheme started. How to Make and Use Compost features a comprehensive A-Z guide, which includes what you can and can't compost, concepts and techniques, and common problems and solutions. Nicky Scott is the coordinator of the Devon Community Composting Network; he helps set up community composting groups and advises schools and businesses on composting kitchen waste. He was involved in the development of the `Scotty's Hot Box' and the `Ridan' composter, both now widely used for composting food waste. 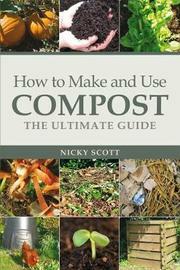 Nicky is the author of Composting for All and Composting: an easy household guide.